The concrete monoliths that line the waterfront next to Sunset Park fade from view at one particular angle. This stretch is significantly quieter than the rest of the waterfront. Between two mourning trees is a wooden bench where Suhasini and Haider come and sit, catching glimpses of the water in silence , in a life that was once a cacophony of sounds, but now serving out a sentence as final as death. It is dusk and time to go home. Suhasini looks at her husband, her glance shattering and piercing through the cloak of melancholy shrouding her husband. 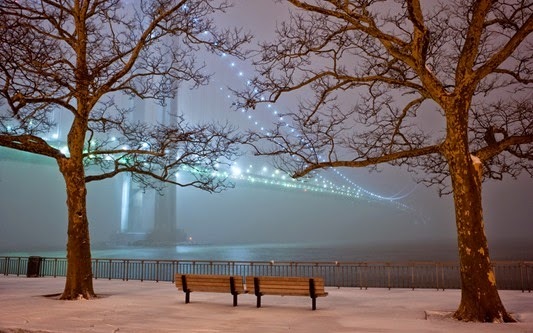 He nods and says,” a few minutes more.” She sinks back in her corner of the bench and looks outwards at the twinkling lights of the bridge. Massive skylights hover above the atrium, beyond the bridge. The atrium was built at a huge cost by the Thane Construction Company. In addition to its 11 acres of floor space, the complex was completed with four piers, each linked by underground tunnels. Suhasini remembers the the architect’s inaugural statement of “the great red bricked building rise above the streets and waterfront like some vast medieval city’s wall,” giving an impression of power and beauty. An involuntary shudder escapes her body and she draws her gaze away and towards the trees. She likes the two trees, finding in their bare branches, gnarled trunk and a handful of yellow leaves both comfort and companionship. A wrinkled yellow leaf , escaping the clutches of the branch to which it had been tenuously joined, languidly brushed past Suhasini. She feels a featherlight touch on her cheek, almost like a farewell kiss, and then the leaf floats towards the gleaming water, settling lightly on it. The water swirls welcomingly around the leaf, before taking it away. To where it had taken Ritu ? She looks guiltily at Haider, only to find him looking at her. Had he heard her thought? Haider came to her and said, “ it is time we went”. She understood and followed him- down the waterfront, down the east pier, up the steps of the atrium, down the top window, into the water, down and down…To where Ritu, their daughter had gone when she had committed suicide, on just such an evening of twinkling lights over the Eastern bridge. Shilpa, isn't life heart wrenching sometimes too, Shilpa? Oh, and a very happy friendship day, Anju! Glad to have added another gem to my treasure! Touching, felt real Anju. Nice post. Thank you so much, Shweta. Thinking of some things ‘french’.